Have you ever considered the massive number of people they can pack into a football stadium like Michigan Stadium in Ann Arbor? The largest stadium in North America holds 107,601 screaming fans. It strikes me that somewhere in that crowd there must be at least 10,000 singers yelling at the top of their lungs, blithely ignoring the risk of damaging their voices. Events like football can result in terrible injuries—and they don’t all take place on the field. Some injuries take place inside the throats of enthusiastic fans not only in outdoor stadiums, but in sports bars, and even in your home as you watch the game with friends. Yelling tears up a fan’s vocal cords, inviting damage that may persist long after football season is over. 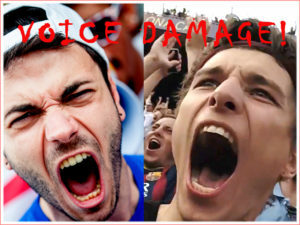 Repeated yelling puts severe friction and pressure on the vocal cords. A sports enthusiast who is also a singer risks becoming hoarse, losing their voice, or even developing vocal nodes. This is bad enough for the normal fan, but disastrous for a singer. Nodes are like calluses, they form on the vocal cords to protect them from strain. Building a barrier is the body’s defense. However swollen nodes get in the way and keep the vocal cords from fitting together cleanly. Over time, these nodes may require surgery. 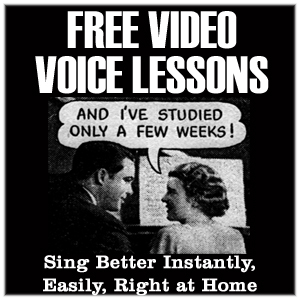 This can bring a singer’s career to a halt. 1) When you are expressing support for your team, breathe low and support the yelling by contracting your lower abdominal muscles. Do not scream from the throat! 2) Consider taking a noise maker and use it instead of screaming. 3) Dress appropriately. Layer clothing so the layers can be removed or added—as needed. Fans should take a warm scarf to protect the throat. 4) Drink plenty of fluids. Limit beverages that dehydrate, such as alcohol and caffeinated drinks. As in football, the best defense for the voice is a good offense. Don’t wait until the damage is done to take precautions. Even though it is normal to be enthusiastic during a sporting event, think twice before getting carried away. I prepared an environmental noise impact assesment for Giant’s ball park. People can be noisy! Also concerts. Doing Mozart Req with UCAC at Hertz hall this weekend! I love Motzart’s Req but not fond of noisy restaurants either. Great article!! Thanks so much! Thank you so much Jodie, I’m glad you enjoyed the article.